Do you have a destination you adore and frequently return to? In my books there are very few of those places. I generally try and hit a new spot every time, because it's a big world out there and so much to see in our short life time. Other then home, Bali and St Moritz are on my 'special' list where I feel an attachment and been more then a handful of times. But I must now add Morocco. It's a magical place full of charm with warm hearted people that make you feel welcomed. 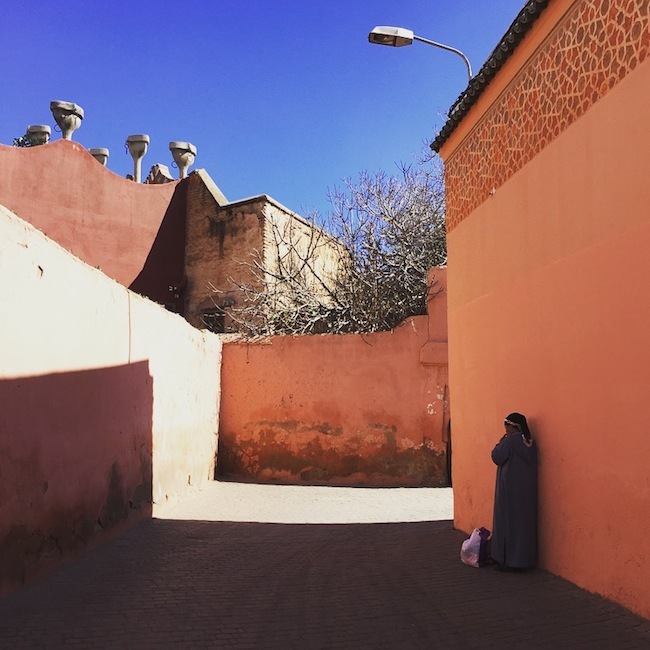 I was in Morocco seven years ago, before it became a buzz destination on the travel radar. 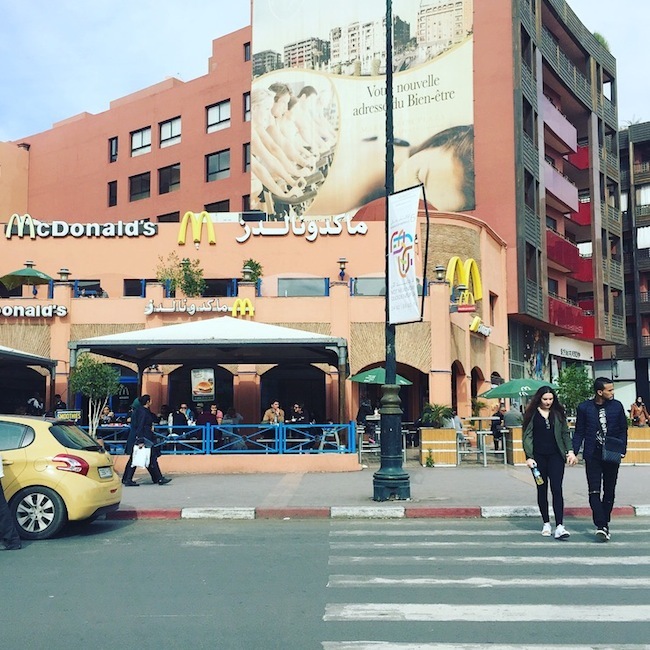 In the past year I've noticed Moroccan tourism on the rise. This got me itching to return. 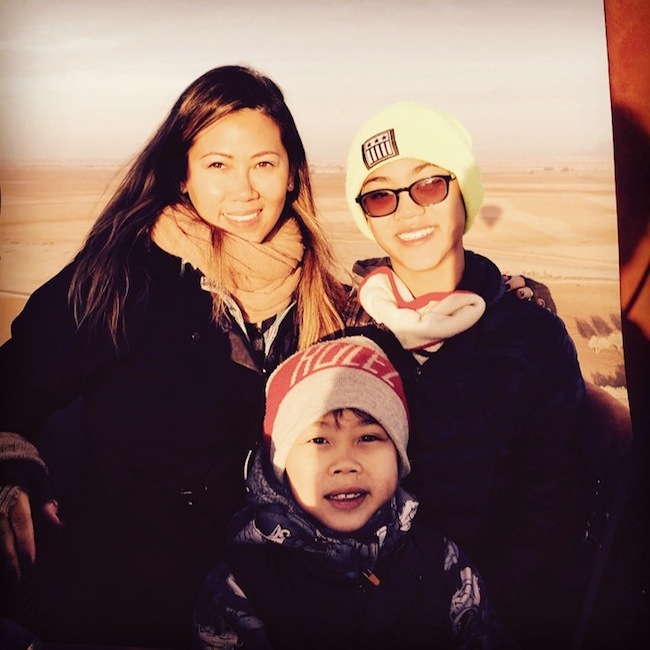 Thus the kids and I jetted off for Winter break to re-visit it for a week. It was more then words can describe. Everything I remember it being seven years ago remains the exact same. Just it's cooler now with many new hip restaurants, bars, shops and more people that speak English. 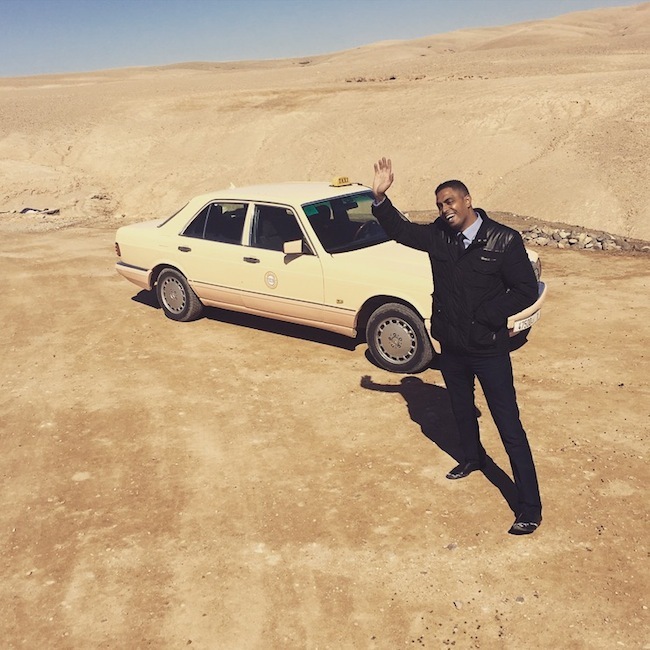 Even taxi drivers. Thank God! 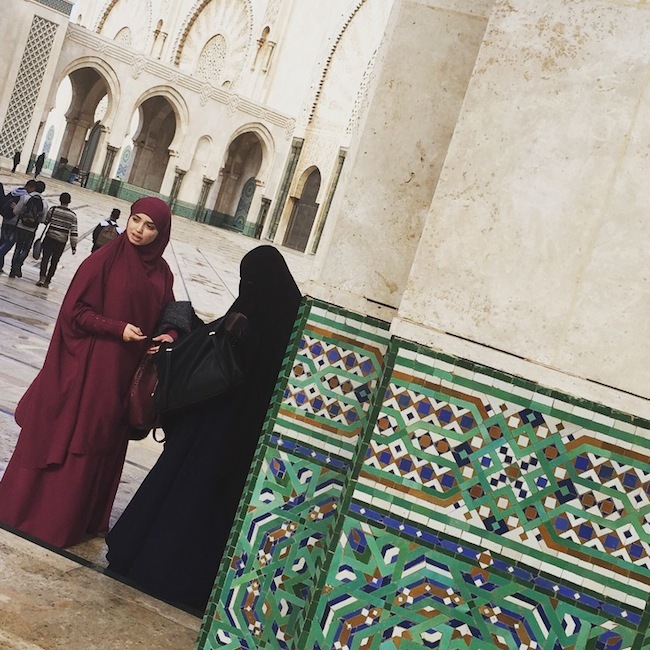 Language was a huge barrier before with the locals only speaking their native tongue - Arabic or French. No I do not 'Parlez - vous Francais' speak French! My bad for being the bratty American expecting foreign country locals to speak my language, when it should really be the other way around. I admit that! But even though I'm horrible at learning languages, hand signals and a smile go a long way. That is universal talk. Master it! We flew direct New York to Casablanca on the red eye and arrived at 9am. We had 5 hours to kill before our connecting flight to Marrakech. 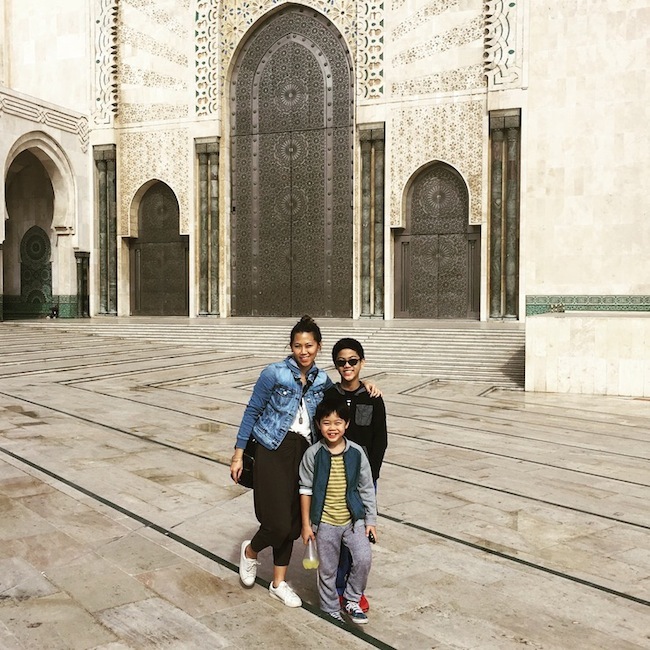 We took advantage of that to exit the airport and hit the one and only 'real' attraction in Casablanca - The Mosque. Other then that it's just a same ole' bustling city that doesn't provide much eye candy. P.S. 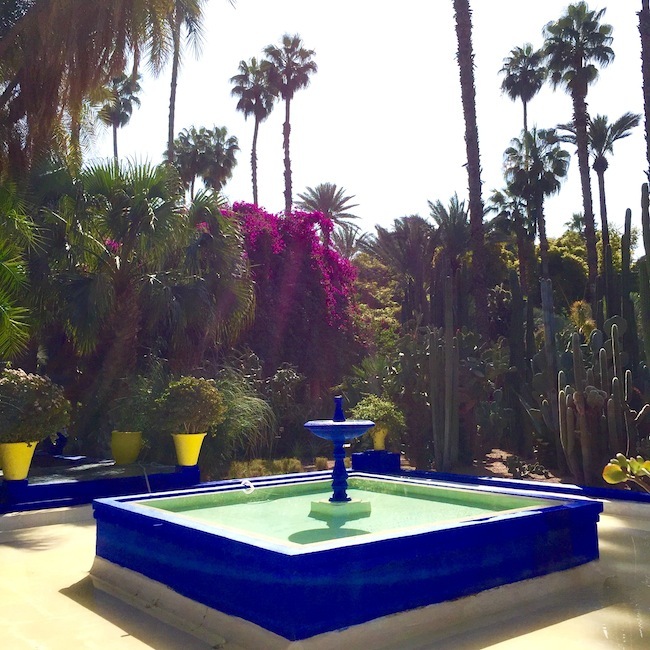 At the time of booking our flights I didn't realize that Marrakech is only about a 4 hour drive from Casablanca. It would have probably made more sense to drive instead of waste time hassling with the airport rantics, and catching a 30 minute flight. No joke. The flight was up and down so fast they didn't even have time to serve you a drink! This is so worth the detour. You don't want to miss this! It is the largest mosque in Morocco, built in 1993, and has the tallest minaret tower in the world. It's mind blowing from the outside. The tile work, marble floors, pillars, arches, domes, everything speaks on a GRAND scale. But not in an ostentatious flashy gold tooth way. It is very tastefully designed and all the materials used are top of the line. Amazingly beautiful! Tourist are allowed to visit inside. But unfortunately we arrived on a Friday, which is Muslims main day of prayer, as is Sunday for Christians. So they were not allowing visitors inside until after prayers finished at 3pm on Friday, which was too late for us, since we had to catch our flight to Marrakech. Therefore keep Fridays rules in mind if you want to visit, and plan accordingly. However, even though the interior was shut off, we were still able to walk the 22 acre complex and be up close to the exterior. It definitely kept our sleepy jet lagged eyes open, and the photos still wow me now! It was my mission to conquer this town! 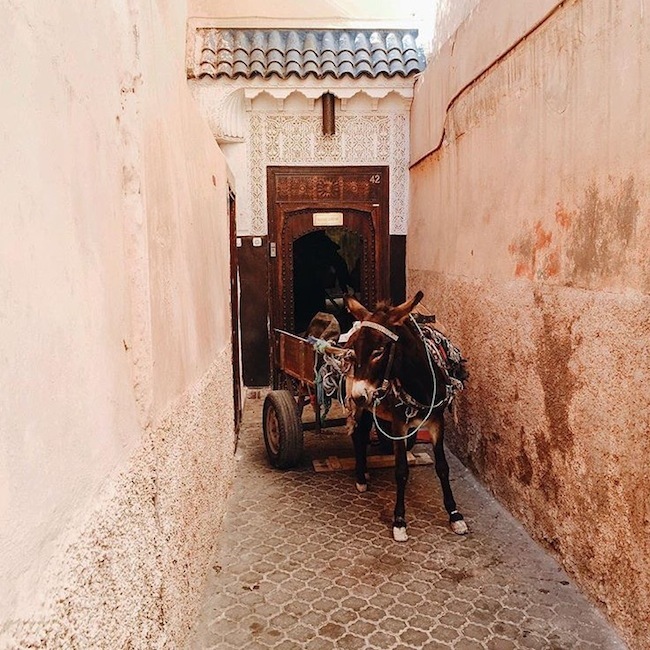 We stayed for six days straight in the old Medina and after getting lost walking around many times I eventually got my bearings and became quite familiar with the area. But there is still loads more to see for the next time. I mean the souks alone you could spend days in without needing to come out for air! It's dangerous in such a good way. 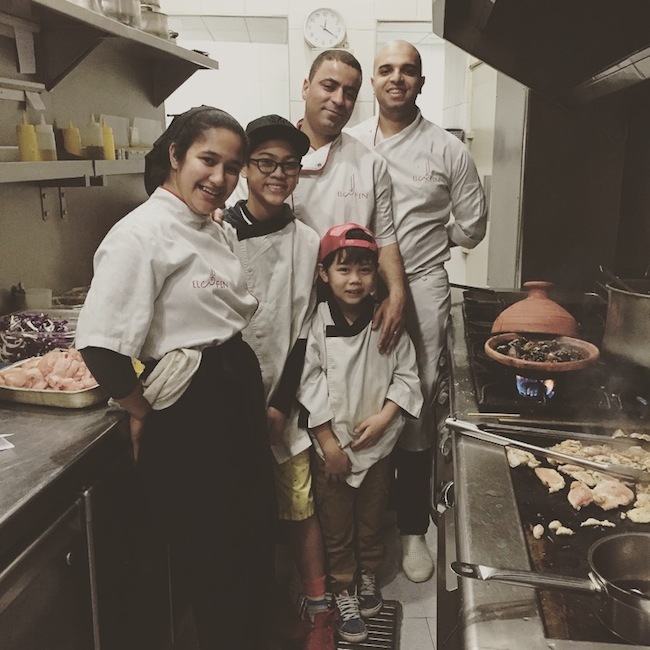 If you love Moroccan food you should take a cooking class. It was a memorable experience with my kids, and we brought home skills that will impress even our snobbiest of guests! Details about our experience on a separate post. It's a market. An interesting one with a lot going on! Snake charmers, street performers, souvenir knick knacks, vegetable stands, a gazillion food stalls and clouds of smoke coming off lit grills. Crazy and packed at night but an eye opener. Dusk is the best time to watch the action. Traffic is closed off within the square, and we escaped on a tuk -tuk, a tricycle rickshaw. All part of the adventure! There are a bunch of riads in Marrakech. This was my favorite. Modern, and bright. 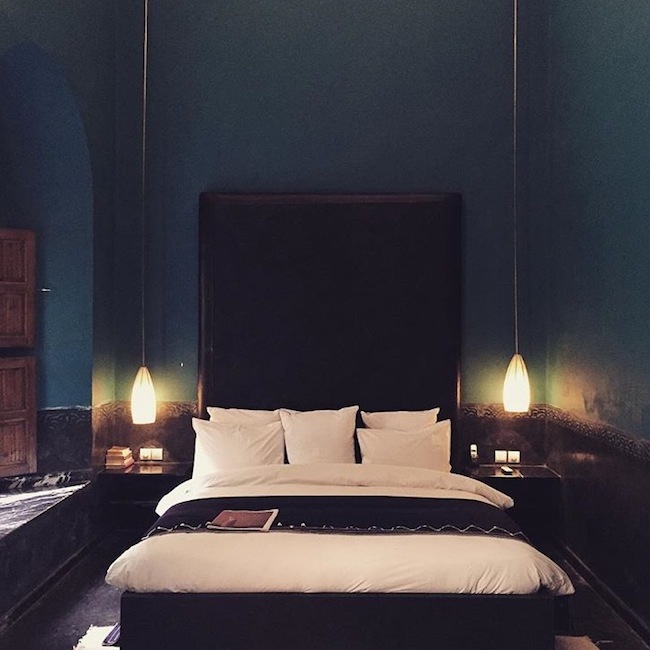 During your trip you must at least visit one riad if you don't stay in one. Go for a drink or a meal. The architecture and design concept behind the riad layout is of historical interest as explained in my previous post. An area, known as the new city, built 10 minutes away from the old. I really wasn't impressed especially coming from the historic old Medina area that provides so much more color in all shapes and forms. However, Gueliz area should still be visited just for a quick walk to see the contrast between old and new. It will give you some Miami vibes. Another modern area, adjacent to the new city. Home to upscale hotels, like The Delano a.k.a The Pearl, and designer boutiques. Again not my cup of tea, but may be yours if your looking for something modern that feels closer to the Western world. A 12 acre garden built by the fashion designer Yves Saint Laurent. 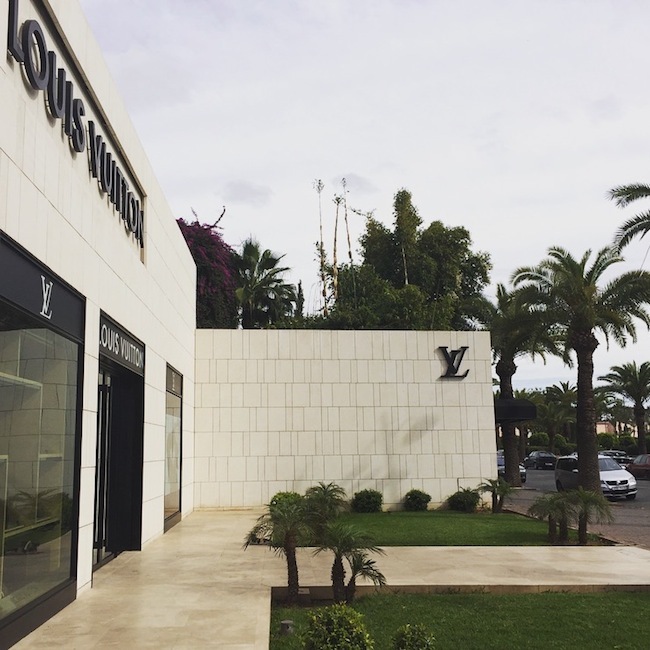 It is a fashionista oasis. I was drawn more to the structures and pop colors of blue, yellow, green and orange more so then the nature. Not to say that the nature shouldn't be respected! It's something different and pretty to visit. Their museum is also a treat to view the Moroccan indigenous people 'Berber' artifacts. The jewelry collection was fab! If you don't visit the mosque in Casablanca then you should at least see one mosque and this would be it. Not as grand as Casablanca's, but still gives you a feel for us non- Muslims. Step inside and you will feel like an Arab Princess! This palace's decor felt grand and luxe. Tile work in their courtyards was jaw dropping, and their outdoor gardens equally as beautiful. The 1st riad we stayed in seven years ago! Brought back memories when we re-visited. Honestly hasn't changed much though! Decor is on the traditional side. 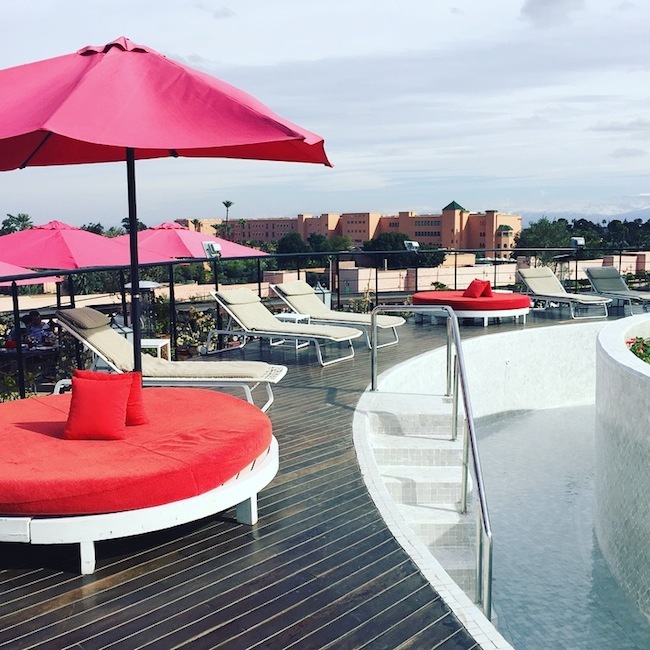 Their rooftop offers splendid views over looking the Kasbah market. This after the ginormous mosque in Casablanca is the second must see in Morocco. Otherwise known as the Arabic school, which was once the Islamic college founded in the 14th century. 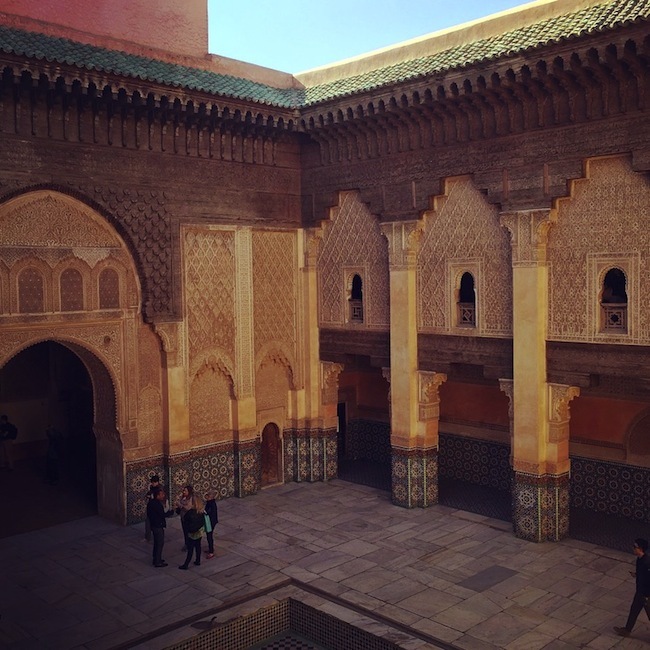 The prayer halls and courtyards are adorned with amazing mosaic tiles, carved stucco arches, and cedar wood windows. True Moorish architecture that is exquisite. The heart of the old city. We stayed within these red walls, and slept, inhaled and ate it. In my opinion it's the best part of Marrakech. Authentic. The street life emerges you and gives a full flavored cultural dose that you can't find anywhere else. Glamping in the desert. The tents aren't shabby and are furnished nicely, with private bathrooms and a proper bed in your tent. View of the snow capped Atlas mountains while you dine al fresco are a plus. Camel rides can also be arranged. Otherwise bring a good book, star gaze and get lost in nature. It's less then an hour away from Marrakech, so we didn't stay overnight and just went for the day. Good option if you only have time for a quick taste of desert vibes. One thing I didn't try this time! BOO. But I experienced it before so no real lost. It is the traditional Moroccan black soap body scrub and clay mask treatment that leaves you silky smooth. Must try if you haven't before! 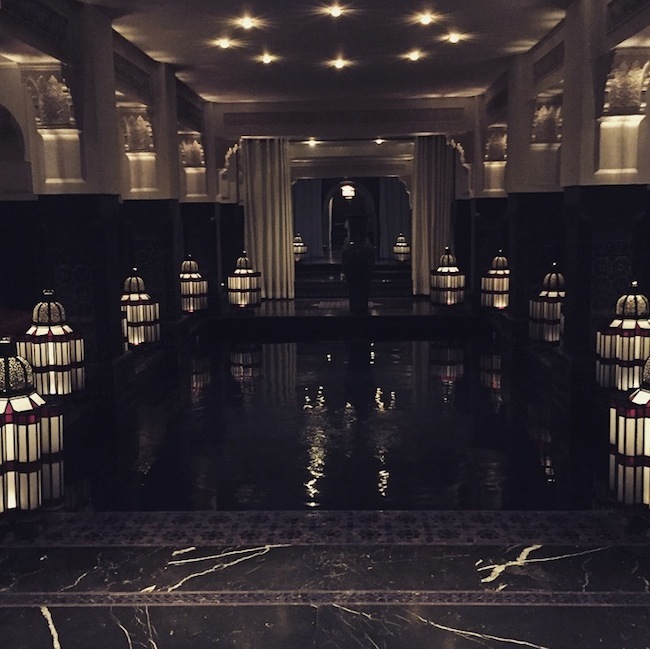 All hotel spas such as the La Mamounia below or El Fenn riad offer it, and you can book an appointment at the spa without being a guest. Go chill. Enjoy! Have you been up in one before? This was our 1st time. It was totally worth waking up at 5am for! I was worried it would be bumpy. But surprizingly it was a very smooth ride and landing as you glided through the sky. What a high! With our package a typical Berber breakfast when we landed back on Earth was included. 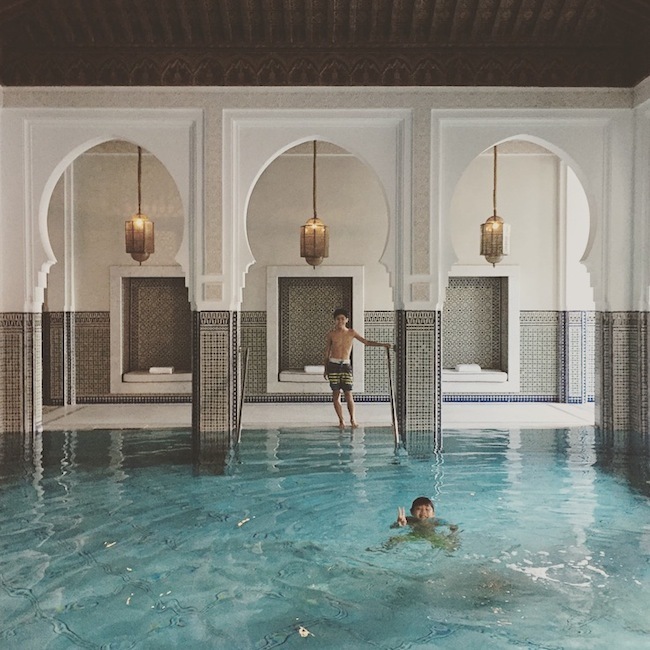 Most riads and definitely hotels have a pool. But possibly they're not indoors. Even though my polar bears don't mind a cold pool, I refuse to jump in! Had it been summer I could've used that refreshing dip. However it was winter when we were there, highs only in the 60's, so I needed a temperature controlled indoor pool to not freeze my buns off. I found it! 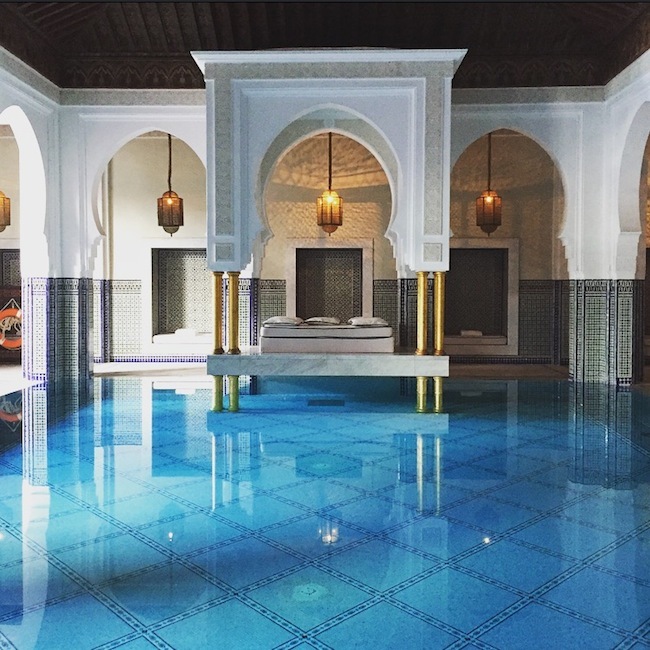 Got a day pass to use the facilities at the La Mamounia, that include not just the two pools, but also access to their gym, tennis courts and spa for the day. A little pricey, about USD 50 per person, but worth it. Their indoor spa pool and jacuzzi was heaven. We got spoilt! The ultimate bazaar shopping where your eyes can wander and twinkle looking at apparel, blankets, rugs, lanterns, food…you name it and they probably got it somewhere in there! I do recommend you a get a guide to show you around. We got really lost the first time we went in alone. But it is a place where you must allow yourself to get lost because that's part of the experience. However when your kids are tired and ready to go home, I also want to know how the heck to get out as fast as possible before a major melt down starts! Our guide showed us an exit strategy. It was helpful for the days after when we ventured into the back alleys alone for the remainder of our stay. All those rugs you see in the West Elm catalogues and in the specialty stores like ABC carpet and home originate from here. So said the salesman! Maybe it was a lie, but I fell for it and got sold on a rug to bring home! It is the land of rugs, and prices are at least a third of the price they are marked up in the USA for, even after shipping costs. You can't loose here! Buy one and you will support the Moroccan work force. It is regulated by their government to prohibit any machine made rugs in Morocco, to protect the domestic skills and labor force. Clever! 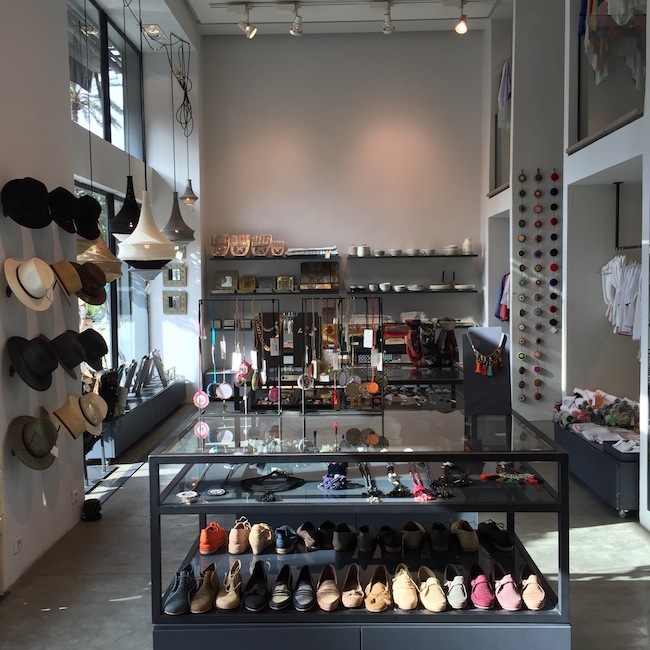 A boutique that looks like something you would find in NYC. 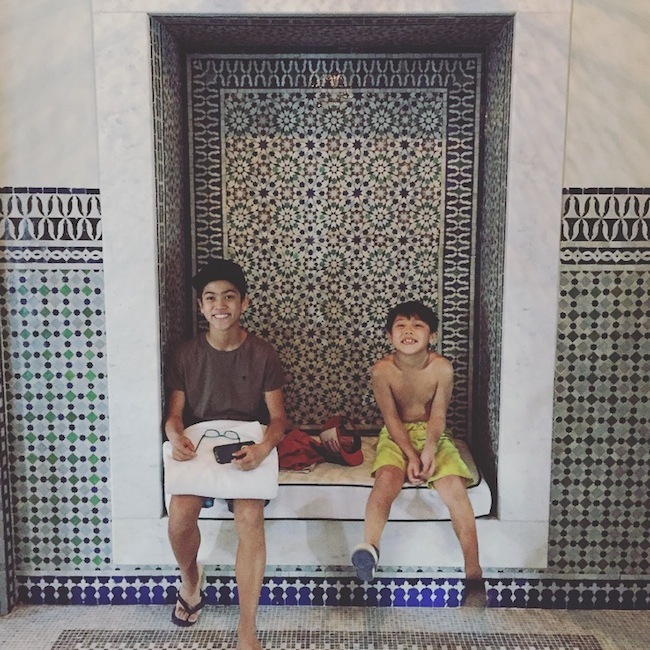 The best local Moroccan designers items have been selected from apparel for kids and adults, to art, home accessories and jewelry. They also have a very nifty coffee shop tucked in the back. I found my babouche Moroccan slippers I was on a hunt for here. Plus a bunch of other goodies! The gardens shop is creme de la creme. We visited on our first day, and I saw a super soft pom pom mohair wool blanket I wanted in there, but I thought I could get it for cheaper in the souks. After searching high and low in the souks for days I could find similar designs, but the quality hand feel was scratchy. 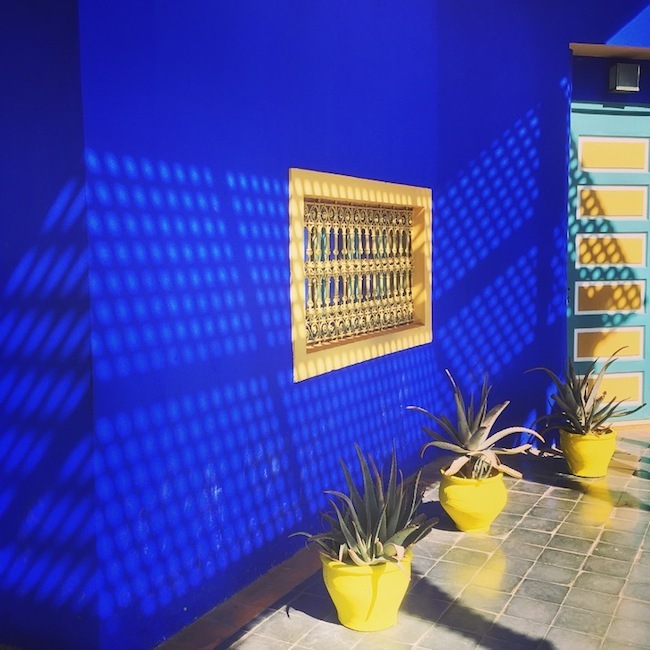 I realized that Jardin Majorelle only carries such luxe items, at a price point to high for the average souk consumer, and probably custom designed it for their boutique. So trust me, if you find something you like in their shop just get it! 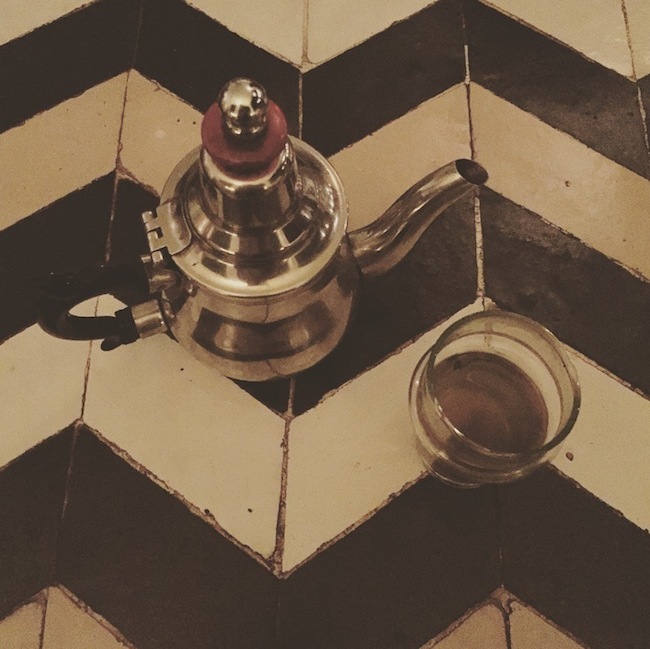 You must try the local Moroccan food - tagine, couscous, tangia, and enjoy the art of being served mint tea. The waiter at El Fenn wins my contest for having the highest and longest tea pour! 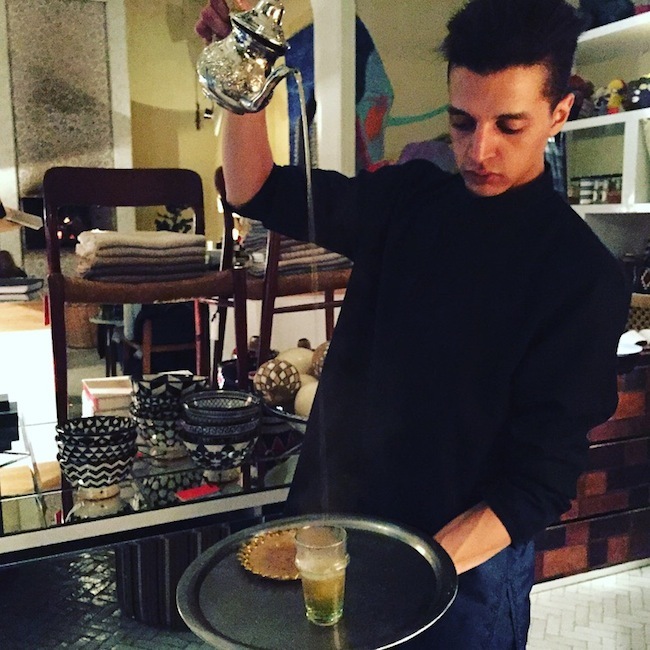 I was fascinated by how they poured tea. HA. I basically ate traditional Moroccan food for every meal, because I love it that much. These places below obviously have good Moroccan food, but supposedly their western food is worthy too. Let me know! Beautiful lush courtyard that welcomes you when you enter. 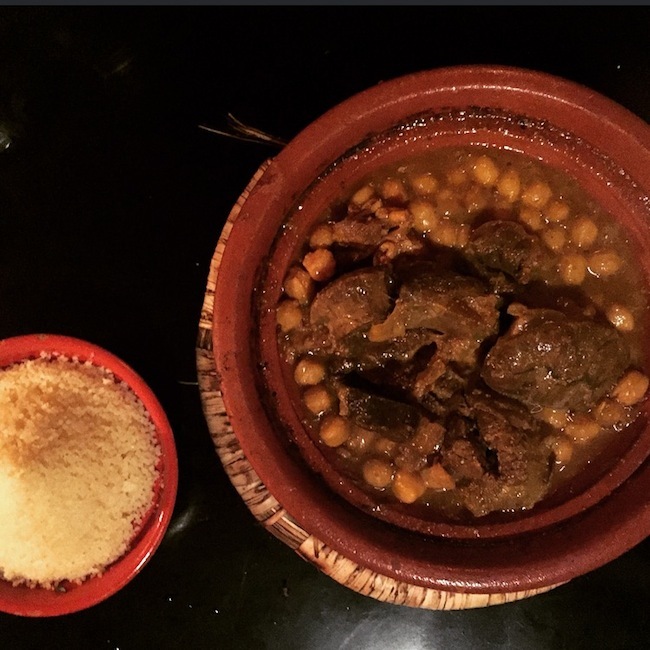 Traditional Moroccan food served. 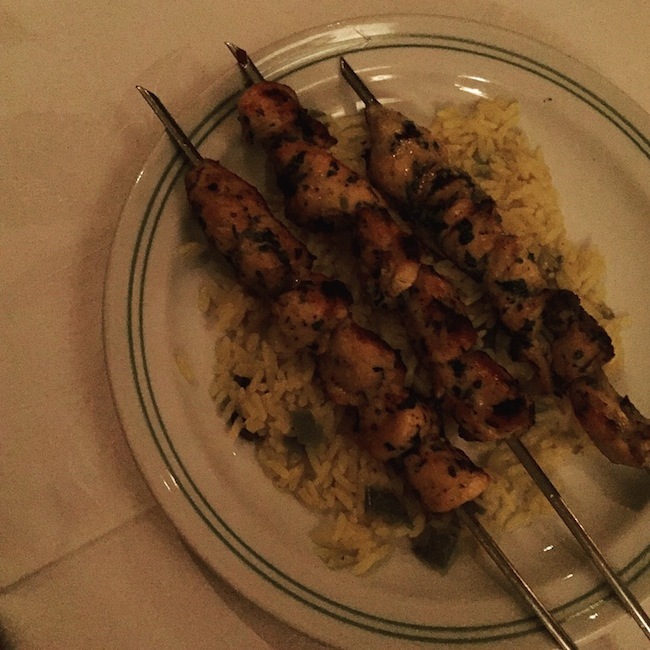 The fish tagine and chicken kebabs were our choice. Tables set within their very hip boutique, in between the merchandise. Shop while you eat concept! Casual. Loved their Harira soup. Tomato based with chickpeas and lentil. Kids ate their beef tangia multiple times during our trip. I guess they loved it! Swanky restaurant that turns after hours into a lounge, with mood lit and pillow filled outdoor space. I had the slow cooked beef tangia, that falls off the bone. After 10pm the belly dancers perform, and the party begins. Fun! If you are in the Gueliz area or need an Asian fix this is a good option. My kids the sushi addicts claimed this to be better then NY sushi. It was just as good! 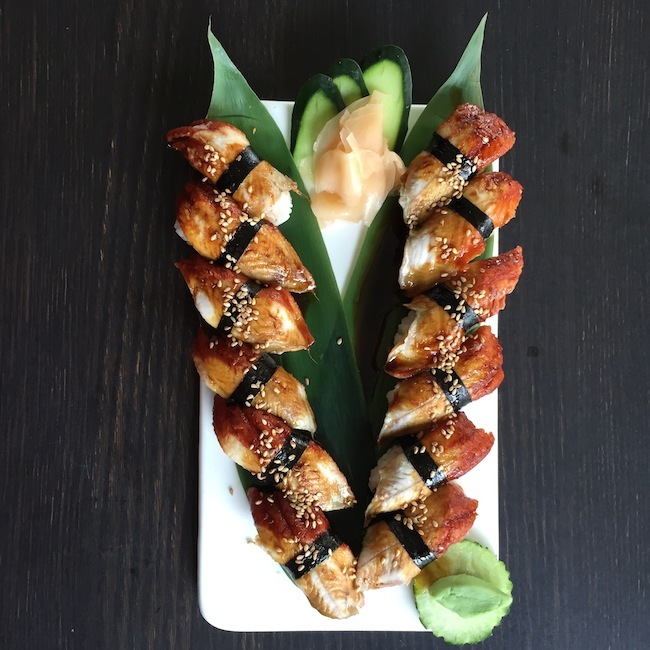 This meets NY standards in looks and taste. Brand new. Upscale brasserie indoor decor, with cozy outdoor seating. 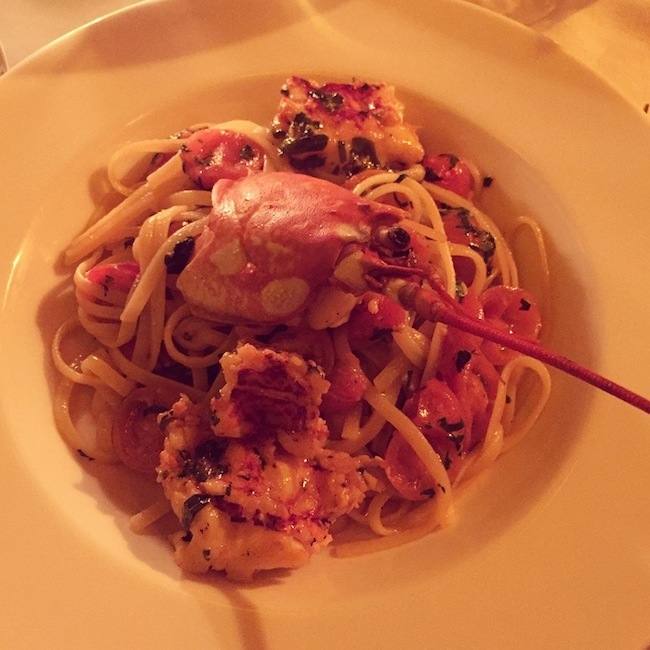 They did not serve Moroccan food, so I was happily forced to eat Lobster Taglietelle, while I picked on the kids Veal Milanese chop and Salmon. So good! 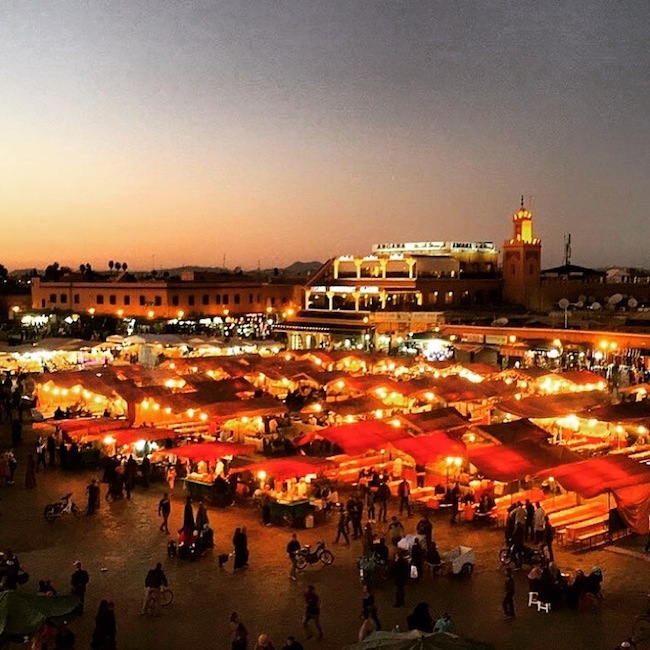 Wine and dine with rooftop views of the souk. 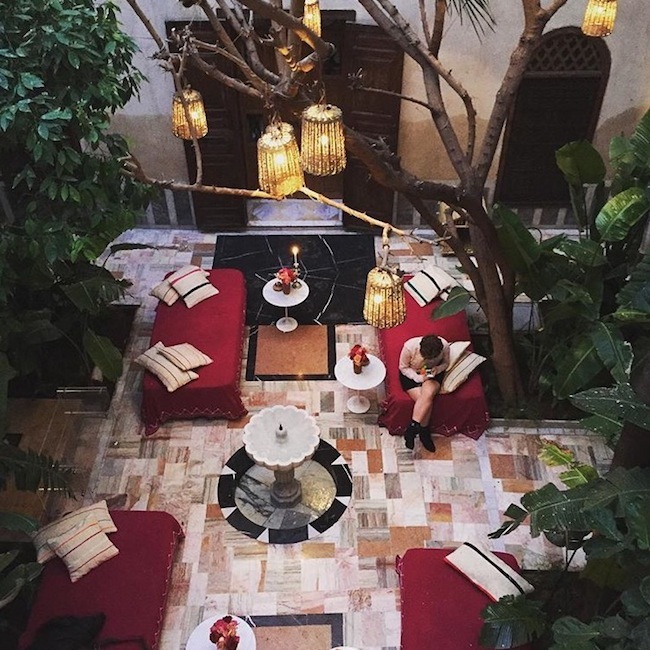 Casual setting, good for lunch if your wandering around inside the souks. We had our daily dose of couscous here. Chicken with seven vegetables. Can't go wrong with that! Another good dinner pick. 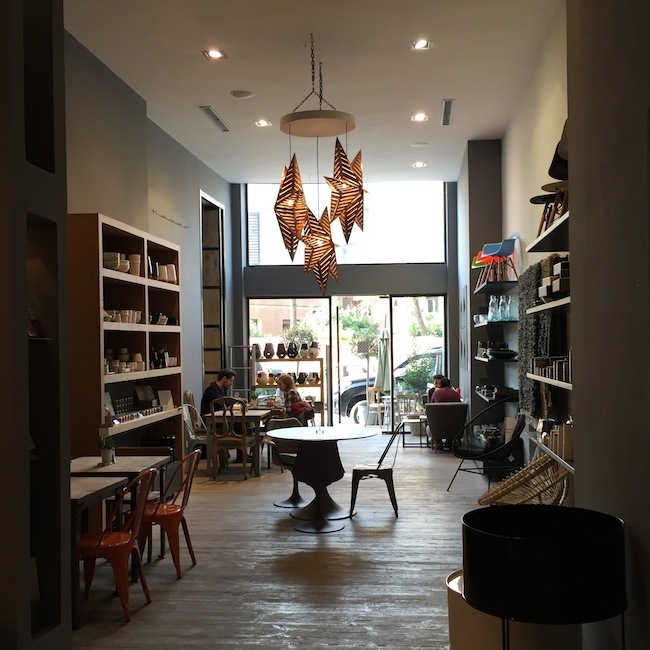 Casual, modern and lively, inside the souks. Dine upstairs, outdoors on the rooftop. A mix of international and Moroccan dishes. Chicken tagine with lemon preserves and olives was my pick. But oops dug in without remembering to click a pic! Well I got one of their teapot to say we were there!! El Fenn all the way! My house of choice, as declared in my last post. Moroccan Dirhams is their local currency. But Euro dollars was accepted too in upscale shops and restaurants. Influenced by the French, the locals eat late, and restaurants tend to not open till 8pm. 7:30pm the earliest. For those with young ones, eating dinner at 6pm is not going to happen! To accommodate this schedule I was getting my kids to have a late afternoon nap, and tea/ snack at 5pm to hold them out till dinner. Keep in mind it is an Islamic country, and you should respect their modesty. Even though they are progressive and modern Muslims, and many of the young local girls dress and look like Kim Kardashian, I would still try and be respectable though. 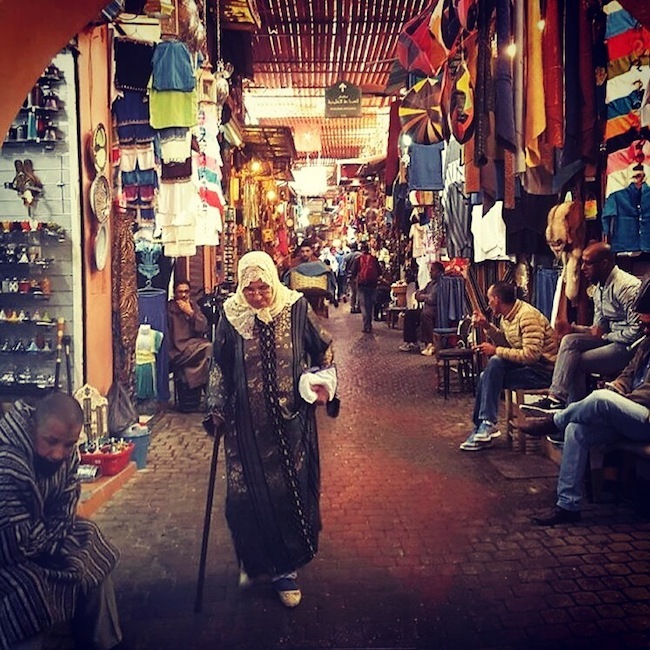 Especially when your walking through the old medina where the average native is usually covered up in cloaks covering them from head to toe. Definitely inside any mosque your legs and arms MUST be covered. Be smart and don't bring negative attention to yourself. When I think of the desert I think scorching hot weather. Yes that's true in summer. But in winter deserts can be cold especially in the mornings and at night. I said the same after returning from Arizona last year. I obviously forgot and girl didn't learn her lesson! I felt like a fool wearing my winter parka at night when psychologically NY is suppose to be colder. However sometimes you got to be practical and not glam for the gram! Glad we had our winter gear to bundle up in for our 1st hot air balloon ride, otherwise it would've been a miserably cold experience. Inspired to visit? It will trigger your five senses. 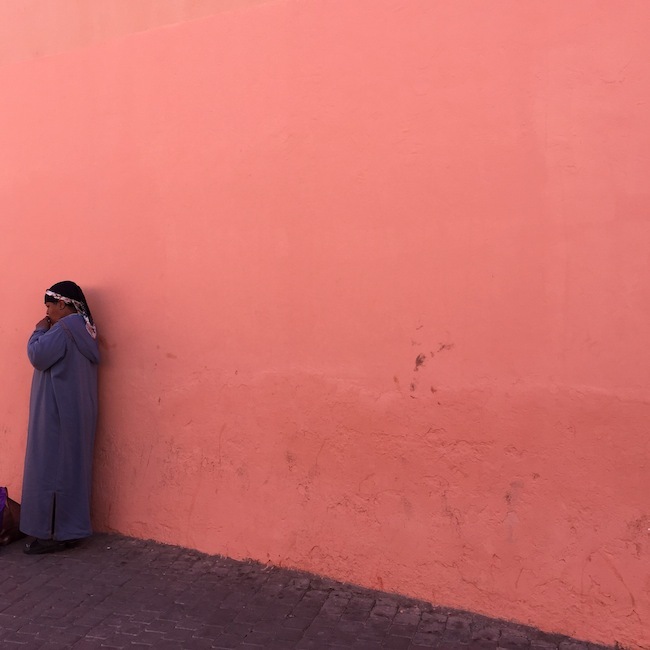 Even though it's a humble city that is a wash of salmon colored clay walls in the Medina area, it is accessorized by very colorful decor and artifacts. All the textiles, rugs, and lanterns will have your eyes rolling 360 degrees. The aroma of spices and tagines cooking on the street sidewalks will constantly make you feel hungry. The abundance of orange and lemon tress that line the sidewalks also add to the street fragrance. If your not a cat lover prep yourself to encounter many roaming around. Don't freak out. It's a good thing. Your safe from seeing any rats! The hustle on the streets is real with donkey pulled carts, bicycles and motorcycles zooming around you and often times too close for comfort. But have faith that you will survive crossing the street. Listen for the daily prayer callings through out the day. It becomes music to the ears. The prayers will give you a sense of time, and for us, acted as a natural alarm clock when we needed to go to lunch and get ready for dinner. There is beauty to a place that's not postcard perfect like Rome, but has it's own character with French influences. You will discover this when your absorb yourself in their world. That's why the more intimate you get the more you see the hidden treasures that grow on you. I do plan to go back to Morocco in another seven years if not sooner. 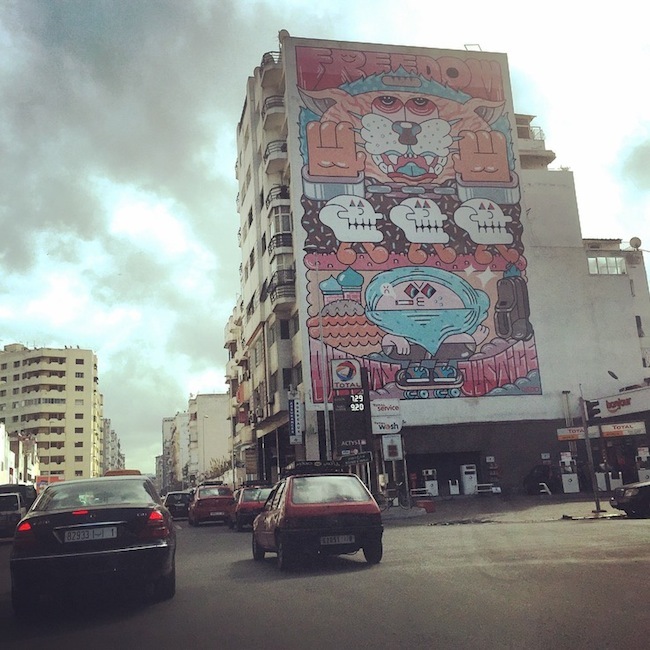 I have interest to follow their progression and explore other neighboring cities such as Fez. I do hope that they continue to preserve the old Medina in Marrakech and keep it authentic, otherwise what a shame! But unfortunately modernism has a way of messing things up. So catch it now if you can, while it still is an amazingly gorgeous playground, because who knows what the future holds.